(TriceEdney) - President Obamas nomination of New York federal prosecutor Loretta Lynch to succeed Eric Holder as attorney general is drawing applause from national civil rights leaders. Despite her stellar reputation, it remains unclear whether Lynch will assume the same civil rights agenda that Holder is leaving unfinished. The nomination of Loretta Lynch to be the new Attorney General of the United States is applaudable and deserving. She is an excellent and worthy choice to succeed Attorney General Eric Holder in his groundbreaking work for the American people, says Rev. Al Sharpton, who has been deeply involved in the case of Michael Brown, shot by Ferguson, Mo. police officer Darren Wilson Aug. 9. Lynch, currently federal prosecutor in Brooklyn, N.Y., would become the nations first Black female attorney general if confirmed by the Senate. Her appointment is considered non-controversial, mainly because she has received bi-partisan confirmations by the Senate in two previous appointments to federal positions. She must now go before the Senate Judiciary Committee; then recieve Senate confirmation by majority vote. "The nomination of Ms. Lynch, who would become the nation's first African American female Attorney General, has signaled that the President is uncompromising and determined that our country's top attorney be dedicated to doing what is right for the American people. President Obama has nominated one of the best and brightest to help lead this nation and move our justice system forward, says Congressional Black Caucus Chairwoman Marcia Fudge (D-Ohio). When the news broke that Holder was resigning, Sharpton, NAACP President Cornell William Brook, National Urban League President Marc Morial, and a string of others were in the midst of a press conference, Sept. 25, expressing high hopes for Holder to take over the criminal investigations in the killings of Michael Brown and the choke-hold death of Staten Island, New Yorker Eric Garner as well as the pandemic of police misconduct around the country, as described by NAACP President/CEO Cornell William Brooks. He also credited her with having successfully prosecuted the terrorists who plotted to bomb the Federal Reserve Bank and the New York City subway; brought charges against public officials in corruption cases; helped to secure billions in settlements from some of the worlds biggest banks accused of fraud and sent some of New Yorks most violent and notorious mobsters and gang members to prison. Loretta might be the only lawyer in America who battles mobsters and drug lords and terrorists, and still has the reputation for being a charming people person, Obama said to laughter in the East Room. 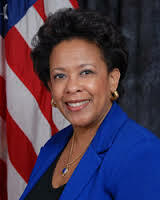 Lynch is a graduate of Harvard College and Harvard Law School and rose from Assistant U.S. Attorney in the Eastern District of New York to Chief of the Long Island Office, Chief Assistant U.S. Attorney, and U.S. Attorney, according to the White House bio. She is the daughter of a school librarian and a fourth-generation Baptist minister. She is married with two step children. (TriceEdney) Theres an old saying, "There is none so blind as (s) he who will not see." My initial understanding and the evolved significance of that statement have come to shape how I view and interpret many of the events that impact my life, community and country. That admission rings more than true as I reflect on the events of the last several weeks and many others in my lifetime of experiences. I speak specifically to the value I see placed on the lives of others and the value of life thats seen and acknowledged when others look at me, and those who look like me. If history shows us nothing else, we have been provided numerous examples of how easy it is to brutalize any group of people and justify the brutality once theyve been dehumanized in the mind and perception of the brute. The history of this nation's inhumane treatment of enslaved Africans, has been justified with their being characterized as sub-human or biblically as descendants of Ham who are obligated to be servants. During this nation's westward expansion, the treatment of Native Americans was made acceptable by characterizing them as "uncivilized savages". The killing of Japanese and Vietnamese opponents in war became easier by calling them "Nips", "Zips", "Slopes" or "Gooks". If we listen closely enough or pay attention, contemporarily, we will hear our Arabic adversaries called "Rag-head Niggers" or "Sand Niggers." As I evaluate unfolding events in Ferguson, MO; Dayton, OH; NYC and an ever increasing list of places, the value perceived in the lives of Black males is minimal and, seemingly, grows less in each passing generation. The answers to the why of this are many, but I believe that until these questions are routinely and continually addressed in the national dialogue, chaos at the treatment of people of color, Black people in general, and Black males, specifically, will continue to be the norm. The volatile reaction of Black residents of Ferguson should not be unexpected when we assess the history of their community policing or hear reports that residents were commonly referred to by those responsible for "serving and protecting" them as "animals" and "savages." I am at a loss to think that anyone could not understand the righteous indignation of the Ferguson community to being occupied by a quasi-military force of oppressors which embraces that mindset. In the eyes of the oppressor, however, mustering that type of response to the community's outrage over the murder of one of their own was a natural first response and the correct method of maintaining proper "control. Therein lies the crux of the problem. Those who oppress or commit acts with racially-based disparate impact don't see the wrong in what they do. Those who traverse life in judgment of others using stereotypes and false characterizations based on their limited experience seek no understanding beyond what they already know. Those who hold conscious or unconscious racial animus can only see life through the lens of their own correctness. Most evil are those who clearly understand their own aspirations for health, peace and happiness for for themselves, their families and friends; yet refuse to accept that others not like them hold similar aspirations. If were to survive as a nation, we must quickly reject notions that have separated us into US and THEM and seek community. The abiding principle that makes a community is the individual's ability to look beyond self-interests to options that enfold the common good. Community is looking beyond what we singularly understand to objectively evaluate, not accept, beliefs and value-systems that exist outside our present understanding. To paraphrase Matthew McConaughey's character in the movie, A Time to Kill, "Look through someone else's eyes and imagine it was you." (TriceEdney) - Because what we must now ask ourselves is when we become equal American citizens what will be our aims and ideals and what will we have to do with selecting these aims and ideals? Is it possible that by running from the issue of racism in America, President Obama has left us stuck in its middle? In the late 1960s, in order to sway disaffected and angry White Southern Democrats into the Republican Party, future president Richard Nixon and Senator Barry Goldwater developed the very effective Southern Strategy. They appealed to the bigoted interests of Southern Whites in states such as Alabama, Georgia, Mississippi, Florida, Kentucky, Virginia, etc. with a narrative that preyed upon their opposition to civil rights, voting rights and support for segregation. Now, youre talking about cutting taxes, and all these things youre talking about are totally economic things and a byproduct of them is, Blacks get hurt worse than whites. 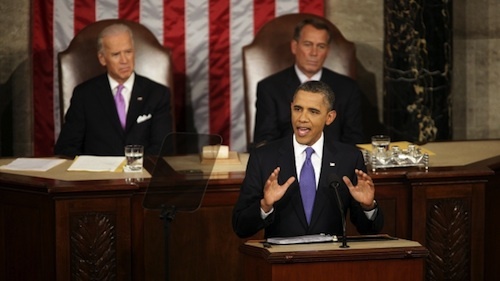 What if President Obama had implemented his own Southern Strategy? What if President Obama had used the power of the presidency and his personality to go on a Southern speaking tour in Kentucky, South Carolina, Virginia, etc. taking on the likes of Senators Graham, McConnell, and former Congressman Cantor head-on the same way Dr. King took on Senator Strom Thurmond (R-Ala.), Gov. George Wallace and Sheriffs Jim Clark and Bull Connor? Would this Obama Southern Strategy win over McConnell, Graham, and their ilk? No! But, Dr. King did not win over racists like Thurmond, Wallace, Bull Conner and Jim Clark. By taking the fight directly to the opponent and allowing those to show themselves as the bigots and racists they really were, Dr. King and the nonviolent movement won over the soul of America. The vestiges of bigotry still exist in the South but America is a better place overall. Goldwaters strategy worked in the South but he lost the rest of America with the exception of his home state of Arizona. In his failed attempt to sooth the American savage racist beast and appease the concerns of White American voters by not appearing to be too Black, President Obama avoided seeking council from true African-American political warriors like former Virginia Gov. Doug Wilder, former California House Speaker Willie Brown and the late Dr. Ronald Walters. Omitting these political giants from his kitchen cabinet has proven to be to his detriment. Their experiences in successfully navigating treacherous political waters would have proven to be invaluable to the first African-American president. As the African-American community deals with the killing of its unarmed men, wealth disparity, voter id laws, mass incarceration, the militarization of police forces, inadequate schools and health care, President Obama should be an angry African-American man. I know I am and I have good reason to be. (TriceEdney) - Relative to the Tuesday Evening Massacre by the Elephants over the Donkeys, in January 2009 I wrote an article that warned about our being complacent and resting on the mere fact that we had elected a Black President. I suggested that we should get busy right away doing the commensurate work it would surely take for us to get something more for our votes than just a good feeling about making history. Obviously, we failed in that regard, and now we are crying about the massacre that took place on November 4, 2014. As far back as 2006 this column and my television show warned against our complacency and settling for an emotional victory rather than a substantive victory. Now we have very little, if anything, to show for our record turnout of 2008 and 2012, because we failed to act appropriately on the morning after those elections. My article, When Elephants and Donkeys Fight, was based on an African proverb that states, When elephants fight, the grass suffers. November 4th was a graphic illustration of that reality for us, the grassroots. And for the next two years the elephants and donkeys will continue to fight and we will continue to suffer. Why? Because we have no clout with either party; we have no say-so about what happens to us. Black voters have been lulled to sleep by patronizing gestures and platitudes from politicians who only want and know they will always receive our votes. They also know that we will not leverage our votes against them nor make demands on them in exchange for our votes. They know all we want to do is vote, and then we will go home and await the next election. When the donkeys won they did not move us to the front of the reciprocity line. They did not acknowledge us by putting forth specific legislation to benefit Black voters. They did not show their appreciation by spending more with our media during their 2012 campaign. No, they needed our votes, which we gave so generously in prior years, but they refused to reciprocate in any meaningful way. Now the donkeys are blaming us for their defeat, saying too few of us voted. Is it really our fault? Are we the reason many of us are crying about the results of the last election? Are we, the Black electorate and the political talking-heads whom we follow, the reasons we will likely spend the next two years in political purgatory? Maybe so, but the real question is: If we got nothing during the first two years of the Obama administration, when the donkeys controlled both houses, what would make any of us believe we will get anything during the next two years? Maybe this is the slap upside our heads that will make us change the way we play politics. Interestingly enough, a group formed in 2007 devised a plan for a President of Black America, which we called the POBA. Unfortunately, Black folks decided to take another nap when it looked like Barack Obama would be elected as the POTUS, and our plan was shelved. In light of Mr. Johnsons article and our previous attempt, now is the time to find the POBA. This is a call for one million conscious Black voters to join the POBA movement. These voters/consumers will use our leverage to positively impact political outcomes and the Black economy, locally and nationally. 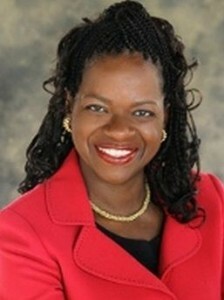 If you want to be One in a Million, contact me at jclingman@blackonomics.com. (TriceEdney) - A survey by the Rainbow/PUSH Coalition, headed by the Rev. Jesse Jackson, shows that there are only three Blacks and 1 Hispanic among the 189 total board members of the 20 technology companies surveyed. That includes just 36 women among the 189 total board members of the 20 companies surveyed. "This data reveals a bold and audacious pattern of exclusion", says a Rainbow/PUSH release. Eleven of the companies have no people of color on their boards, including Facebook, Twitter, Yahoo, eBay, Google among others. Just three companies  Microsoft, Oracle, and Salesforce have a Black or Latino on their Board. In contrast the telecommunication companies with whom many technology are now competing: Verizon alone has three African-Americans on its Board of Directors. ATT has two African-Americans and Comcast one African American on their Boards. Rainbow PUSH has successfully PUSHed the technology to reveal their workforce diversity and inclusion data  the data documents the virtual exclusion of Blacks and Latinos from the industry in both tech and non-tech jobs. This dearth of diversity is replicated on the corporate boards of directors. Its time for a change. Technology companies must transform themselves  from the corporate boards to the workforce  to mirror the communities and customers it relies upon for its growth and success, the statement says. Reverend Jackson says he would continue to PUSH for diversity in Silicon Valley and the technology industry at speaking engagements at Platform in Atlanta, before the New York Venture Capital Association and at a recent USA Today forum at Stanford. Rainbow PUSH is also organizing a Next Steps for Technology workshop on December 10 in Silicon Valley to continue its push to reach, measurable and concrete change in the tech industry. Diversifying the technology industry  from corporate boardrooms to the workforce  is this eras civil rights challenge. While we engaged companies to move from resistance to release and usher in a new climate of transparency, more must be done: companies must set concrete, measurable goals, targets and timetables to expand minority participation on their boards, in their c-suites, and workforce. 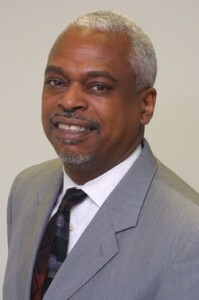 They must expand to engage minority professional and financial services firms, advertising and marketing agencies in their business development," Jackson says. In short, companies need a 21st century diversity and inclusion strategy to change the face of technology. Rainbow PUSH stands ready to partner and produce the talent needed to usher in a new era of change in the tech industry. 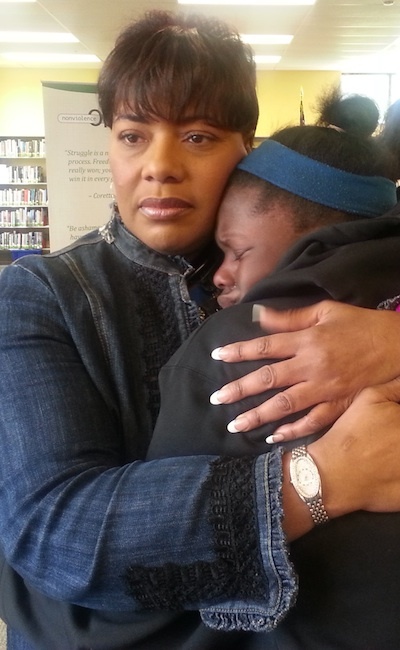 (TriceEdney)  Dr. Bernice King, the youngest daughter of Dr. Martin Luther King Jr., who has led several nonviolence workshops in Ferguson, Mo., said this week that  despite the efforts of nonviolence trainers - she has deep concerns about what could happen once a grand jury decision is announced in the police killing of Michael Brown. Violent behavior by citizens and police that resulted in arrests and fires initially after the shooting is the reason that both citizens and police are tense. Citizens say the overly aggressive, militarized response by police could cause clashes with peaceful protestors; especially since there has been no protest violence in the streets of Ferguson over the past 90 days  only peaceful protests. King, in her role as chief executive officer of The Martin Luther King Jr. Center for Nonviolent Social Change, hopes that regardless of the jurys decision, the peace will prevail. The key she said, is for the residents to focus on long term change rather than momentary rage and short-term reaction  regardless of the jurys decision. King led a team of 10 nonviolence educators from the King Center for several meetings and workshops in Ferguson over the past several months. The team included retired St. Louis Police Department captain, Charles Alphin Sr. and the Rev. 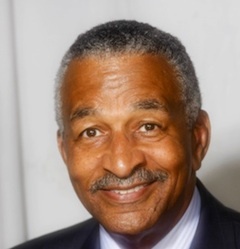 Willie M. Bolden, a former staffer of the Southern Christian Leadership Conference who worked alongside Dr. Martin Luther King in the 1960s. 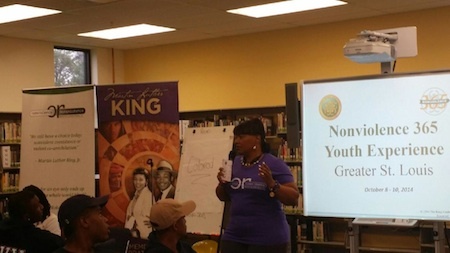 Dr. Bernice King conducts nonviolence training in Ferguson, Mo. Police forces around the country are bracing for the jurys decision which could be announced any day now. Thats because similar violence against unarmed Black men has become epidemic nationwide. But the lack of plans is what King says she has observed among stratified community groups in Ferguson. In the King Center's nonviolence teachings, King says they use lessons and examples from the civil rights movement. As America awaits the decision, King says she believes the nonviolence training has caught hold in key pockets of the Ferguson community. She recalls a pivotal moment during the workshops after showing a video about Bloody Sunday, the 1965 incident during which peaceful marchers were attacked by Alabama State Police as they attempted to cross the Edmund Pettus Bridge in a march from Selma to Montgomery. It was like it was here, like right down there on West Florissant man - the tanks and the tear gas and stuff Im telling you it was real man, King recalls the young mans excitement. West Florissant is the strip of highway where most of the Ferguson protests take place  about three blocks from Canfield Drive where Michael Brown lay dead for four hours before his body was removed. The nonviolence trainers have influenced the mindsets of hundreds of prospective protestors. But that doesnt mean all will be peaceful, King warns. (TriceEdney) - Thousands of voters from across the nation reported problems with voting during this General Election, stemming not only from a rash of restrictive voting laws but also from the administrative deficiencies of an outdated voting system, according to the Election Protection coalition of civil rights groups. Every election should be a celebration of democracy. Instead, what were hearing today from too many polling places around the country is that voters are having problems casting their ballots, said Barbara Arnwine, executive director of the Lawyers Committee for Civil Rights Under Law, during a press call on Nov. 4. Some of the problems were the outcome of controversial election lawssuch as voter ID requirements, reduced early voting, elimination of same-day registration, citizenship requirements and morethat have erected barriers to the ballot box. Today, and for the past several weeks during early voting, we have been witnessing the most unfair, confusing and discriminatory voting landscape in almost 50 years. And, its a disgrace to our citizens, to our nation and to our standing in the world as a beacon of democracy, said Wade Henderson, president and CEO of The Leadership Conference on Civil and Human Rights. Since the game-changing rulingand Congress failure to amend and update the VRA as the high court directed14 states and an untold number of municipalities have introduced new, often limiting election laws. In Texas, for example, the Supreme Courts decision to allow the state to implement its restrictive voter ID law just two weeks before the electionafter protracted legal wranglingfostered widespread confusion that promises to disenfranchise much more than the estimated 600,000 Texansmostly people of colorthat do not possess the accepted forms of identification, activists said. Nicole Austin-Hillery, of the Brennan Center for Justice, which had volunteers on the ground in Texas, shared the story of an elderly African-American women, originally from Mississippi, who had been voting since the age of 18, despite the barriers and dangers associated with the franchise. Unaware the ID she possessed was no longer acceptable, she ventured out to the polls only to be rudely told she could not vote and castigated for not getting the proper ID in time. Others who did try to obtain the IDs had to mount massive bureaucratic hurdles, sometimes without success, and people with military IDs were given conflicting information depending on where they went. Latinos and Asians, particularly minority language Americans who are covered under Section 203 of the VRA, faced significant problems in places like California, Arizona, Pennsylvania and elsewhere. Arturo Vargas, executive director of the NALEO Educational Fund, said, for example, that Latinos in Louisville, Ky., complained of intimidation and lack of assistance from poll workers. This is particularly concerning because we know in Kentucky [there] is an emerging Latino electorate. And what we have seen across the country is that as Latinos become a larger and larger share of the population and the electorate we tend to see a backlash, he said. Jerry Vattamala, an attorney with the Asian American Legal Defense, which was monitoring 147 poll sites in 11 states and Washington, D.C., reported that several jurisdictions covered under Section 203 lacked the required interpreters. More egregiously, he said, a poll worker in Pennsylvania, who was helping a voter who needed language assistance, did not cast ballot for the gubernatorial candidate the voter wanted. And, in a similar case, the poll worker told the voter he/she had to vote yes for all the ballot initiatives. Many of the calls to Election Protections hotlines1-866-OUR-VOTE, 1888-VEY-VOTA (for Hispanics) and 1-888-API-VOTE (for Asians)came from people experiencing administrative problems, however. Today the 1-866 hotline received more than 10,000 calls [mostly from] Florida, Georgia, Texas, New York and California, Arnwine said. In Georgia, specifically, Arnwine said the names of an estimated 40,000 persons who applied to register were still missing from the rolls. As of 8 p.m., election night, the Election Protection hotline had received more than 18,000 calls, a nearly 40 percent increase from calls received in 2010. Similar problems in other states were reported: poor signage and insufficient information concerning poll sites, absence of poll workers, registration lists being delivered late, people who registered not finding their names on lists, Asian Americans with unique naming conventions or long names having to vote provisionally because their names were misspelled during registration, voting machineswhich can be essential to disabled votersnot working, and much more. This isnt what people call voting irregularities; these are large-scale systemic problems that are denying thousands of Americans their most basic right: the right to have their voices heard, Arnwine said. The problems raise, again, the importance of modernizing voter registration and other voting procedures and widely instituting conventions such as same-day registration, which could allow voters to immediately remedy problems caused by administrative errors or some other type of confusion and to vote. Based on what activists are seeing in communities all over the country during this election, if voting barriers are removed, people will turn out, said Miles Rapport, of Common Cause.